The West Cavan/North Leitrim/West Fermanagh area has so much to offer with its unspoilt countryside and magnificent views of its lakes and mountains. So whether you want to unwind or get active, there is an abundance of walking and cycling trails and heritage sites for you to explore, all within a few minutes walk or short drive from the cottage. Glenfarne Nature Trail – beautiful marked walks along the scenic Lough McNean (1 mile from the cottage). The Shannon Pot –a pool in the karst landscape which is the source of the River Shannon. The Leitrim and Cavan Ways –marked walking/cycling trails. Cuilcagh Mountain Trail– this area is designated as a wetland of international importance. 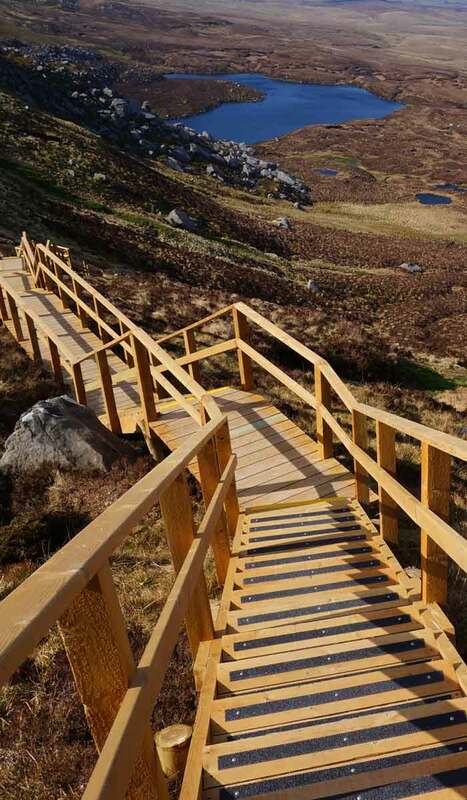 The raised wooden boardwalk must be seen to be believed with glorious views as you climb 1.6kms on a newly constructed raised wooden boardwalk with 120 stepped sections leading to main mountain staircase followed by 450 steps over 36 flights which protects the blanket bog terrain. Glencar Waterfall– 11 kilometres west of Manorhamilton, County Leitrim. Angling – Cavan is widely regarded as Ireland’s finest fishing destination. If fishing is your thing, Cavan is definitely your spot whether it’s coarse, pike or game fishing! There is no licence or fee required to enjoy coarse fishing in County Cavan. Shopping – the towns of Enniskillen, Carrick on Shannon and Sligo are only a short car trip away.